This data set reports on dissolved nutrient concentrations, as well as dissolved oxygen, alkalinity, conductivity, turbidity, and pH measured in water samples collected from nine streams located in the state of Brasilia, Brazil, between September, 2004 and December, 2006. Streams were located in different land cover types including natural (forest), rural (agricultural), and developed landscapes. In addition, water samples from wells, lysimeters, surface runoff, and precipitation were collected from four sites, 2 natural and 2 rural, and analyzed for nutrient concentrations. Streams were sampled every 2-4 weeks; rain water was collected approximately monthly during the wet season and once during a dry season; wells and lysimeters were sampled monthly; and surface runoff collections were event based. There are three comma-delimited data files with this data set. Figure 1. 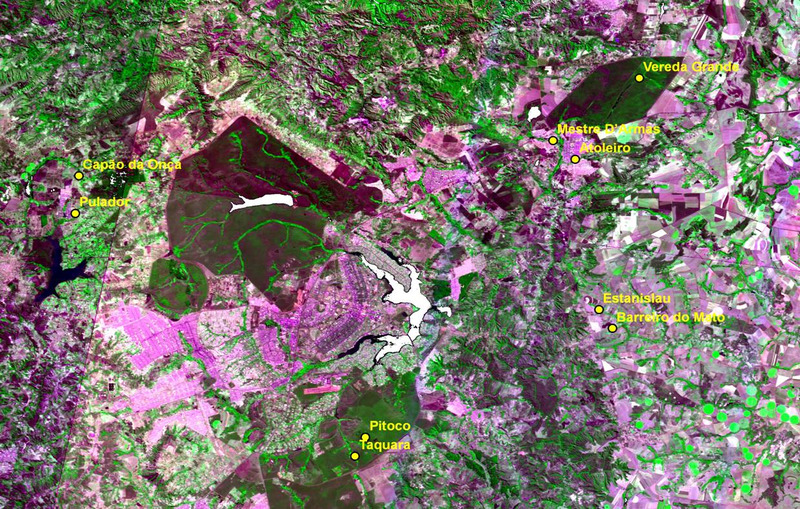 Water samples were collected in three different land cover types from sites near the Brazilian Capital, Brasilia, at the center of the figure. Sites included the natural forested sites at Pitoco, Taquara, and Vereda Grande, rural agricultural sites at Barreiro do Mato and Estanislau, and developed urban sites at Capao da Onca and Mestre D'Armas. The investigators were Zepp, Richard G.; Bustamante, Mercedes M.C. ; Bresolin, Joana Dias; Burke, Roger A.; Carvalho, Arminda Moreira; Cruz, Meyr Pereira; da Rocha, Cristiane Oliveira; Fernandes, Erika Barretto; Ferreira, Joice Nunes; Garcia-Montiel, Diana Cecilia; Kisselle, Keith; Kozovits, Alessandra Rodrigues; Markewitz, Daniel; Molina, Marirosa; Parron, Lucilia; Perez, Katia Sueli Sivek; Pinto, Alexandre de Siqueira; Prado, Cesar Coelho; Rosado, Alexandre Soares; Silva, Dulce Alves da; Silva, Jose Salomao Oliveira; Silva, Maria Regina Sartori da; Sousa, Danielle Matias; and Viana, Laura Tillman. You may contact Bustamante, M. (mercedes@unb.br). Data not available due to missing analyses or measurements are represented by -9999. Measurements below the detection limit of the analytical instruments are represented by-5555. Data not available due to missing analyses or measurements are represented by -9999. Measurements below the detection limit of the analytical instruments are represented by-5555. These data in combination with rainfall and streamflow data provide essential information for nutrient budgets for differing land-uses. The extensive record allows for the assessment of interannual variations. Note that neither steam flow nor precipitation data were provided with this data set. The water samples were collected under base flow conditions except for five collections made during the wet season under storm flow conditions (three times in natural streams (Mar/2006; Dec/2006; Jan/2007) and twice in rural streams (Dec/2006 and Jan/2007)). During sampling under storm flow events stream water level ranged from 67 to 92 cm for Barreiro do Mato stream while for Taquara and Pitoco streams the variations were 65 to 95 and 35 to 38 cm respectively (Silva et al., submitted 2011). Figure 2. 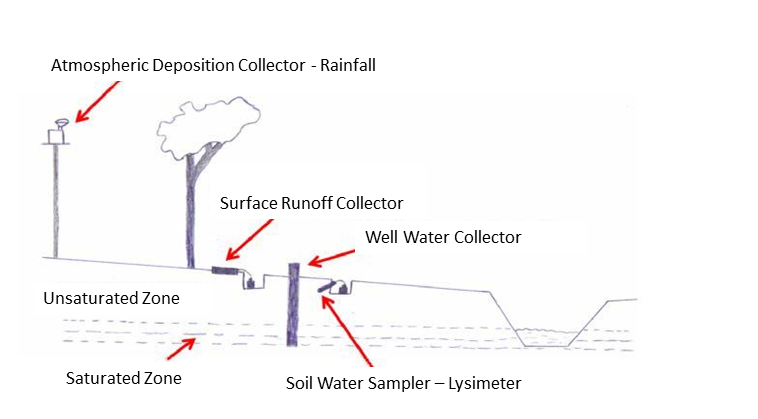 Illustration of the placement of sample collectors in the riparian zone of study streams. After Silva (2008). Data have been reviewed and there are no known problems or expected revisions. The detection limit for ion concentrations (NH4+, NO2-, NO3-, K-, Ca+2, Mg+2, Na+, Cl-, SO4- and PO4-) was 0.05 mg/l. Water was sampled from sites with three different types of land cover in Brasilia, Brazil: natural (forest), rural (agricultural), or urban. Natural stream sites were located at Pitoco, Taquara, and Vereda Grande. Rural sites included Barreiro do Mato, Capao da Onca, and Estanislau. The urban stream sites sampled were Atoleiro, Mestre D'Armas, and the basin of the Pulador stream. Samples were collected from streams, rainwater, surface water run-off, and wells, during the wet and dry seasons. Stream water was collected directly in the streams from all three different land cover types. Natural stream sites sampled were located at Pitoco, Taquara, and Vereda Grande, rural sites included Barreiro do Mato, Capao da Onca, and Estanislau, and urban stream sites sampled were Atoleiro and Mestre D'Armas, in the city of Planaltina, and the basin of the Pulador, located near Brazlandia. 250-ml polypropylene bottles were used to collect the samples and immediately stored in iceboxes. Electrical conductivity, pH, and dissolved oxygen measurements were taken in situ. Electrical conductivity and pH were logged with a multi-parameter sonde (OAKTON 10 series), while dissolved oxygen was measured using an oximeter (AP 64 - Fisher Scientific). Pressure lysimeters were installed at 50 centimeter depth at the Pitoco and Taquara natural sites, and Barreiro do Mato and Estanislau rural sites. 60 bars of pressure were applied to the lysimeters using a vacuum pump, and collected soil water samples were stored in a glass bottle in situ until the next collection point. Well water was sampled at the Pitoco and Taquara natural sites, and Barreiro do Mato and Estanislau rural sites. Rainfall was collected from the Pitoco and Taquara natural sites, and Estanislau rural site. Rainfall collectors were composed of a 5 L polyethylene bottle which was painted with one layer of black paint and a second layer of white paint to reduce the possibility of algal growth and a 18-cm diameter polypropylene funnel which was covered by a fine nylon mesh (2 mm openings) to prevent the introduction of insects or other contaminants. Collectors were attached to wooden posts at 2.3 m above the ground in an open area. Surface runoff was collected from the Pitoco and Taquara natural sites, and Estanislau and Barreiro do Mato rural sites. Collectors were wooden frames (1 m long x 2 m wide x 0.1 m height) installed in the ground so that 0.07 m of the height was buried. Collector sites were chosen where there was sufficient downward slope to allow for the drainage of surface runoff. PVC tubing was connected to the lower edge of the frame in order to channel the surface runoff into a polyethylene bottle, similar to the ones used in the rainfall collectors. This bottle was installed in the soil below the collector frame and connected to the lower edge by plastic tubing. Figure 3. Typical streams sampled in A) natural, B) urban, and C) rural land cover types. From Silva (2008). In the laboratory, unfiltered aliquots were taken for alkalinity and turbidity, while aliquots filtered through cellulose acetate filters (nominal pore size 0.45 mm) were used for DOC, TDN and major ion analyses. Turbidity was determined with a turbidimeter (HACH 2001 NA). Alkalinity determinations were by endpoint titrations with H2SO4 0.002 N to pH 4.5, DOC was determinate with a carbon analyzer (Shimadzu TOC 5000, Columbia, Maryland, USA), TDN with persulfate digestion (Koroleff 1983) and major ions by Liquid Ion Chromatography (Dionex DX 500, Sunnyvale, California, USA). Koroleff, F. 1983. Total & organic nitrogen. In: K. Grasshoff, M. Ehrardt and K. Kremling, Editors, Methods of Seawater Analysis, Verlag Chemie, Weinheim, pp. 162-173.